Rotary extended to Saipan during PP Jim’s administration. PP Robert J. Barry was appointed by Rotary International as the special representative to chair the extension committee to look into the feasibility of extending Rotary to Saipan.The extension survey made by PP Bob Barry and Rtn. 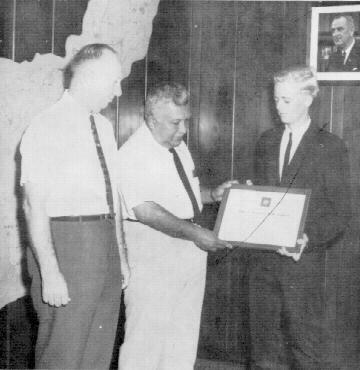 Bill Gibson submitted on 17 June 1966, shows that Dave Sablan and John Trace, two former members of the Rotary Club of Guam, and Jim Hawkins, a former members of the Rotary Club of Juneau, Alaska, were residing in Saipan. 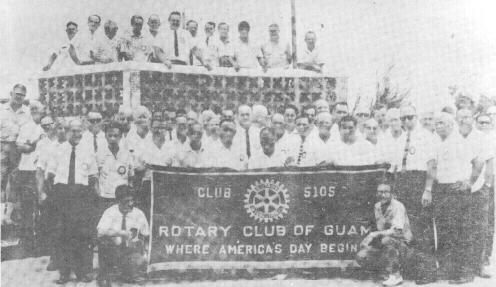 As a result of the efforts of these dedicated men, an organizational meeting was held on 27 January 1968 at the Royal Taga Hotel on Saipan, with 32 Charter members of the provisional club and 25 visiting Rotarians from Guam in attendance, and on 1 February, 1968, the Special Representative report, together with the application and the list of the 28 charter members, were forwarded to Mr. Kendall w. Young of Rotary International. The never to be forgotten charter presentation was held on 22 March 1968 at the Royal Taga Hotel. The importance of this occasion to the World of Rotary and the northern islands of the Pacific, in particular, can be gauged by reference to the program, the distinguished guest list and the variety of the entertainment. That the club was successfully launched is testified to by the tremendous 10th Anniversary celebrations held on 16 February 1978. Arentzen, Leslie Perdew, George M.
Carr, Charles L. Sablan, David M.
Craley, N. Neiman(Jr.) Sablan David S.
Curtis, Russell G. Shoecraft, Robert K.
Doctor, Wilfredo C. Sprout, Manuel N.
Dudley, Max Tenorio, Jose C.
Ekman, Robert F. Tenorio, Pedro P.
Gardner, Stephan M. Thaxton, Louis C.
Gella, Roland Tman, Luke M.
Kerr, William G. Trace, John R.
Maratita, David Turner, Kelly D.
Mooney, William E. Villagomez, Manuel S.
It seems only recently, but a decade has passed. Thanks of the fact that Saipan was admitted into R.I. District 258 only several years ago, I am very surprised at the quick passage of time—Saipan Rotary Club is now 10 years old—really time flies like an arrow. What have we done and what can we do in these quick passing years? The ability of man is limited;; it will be beyond my power to light up the whole of a realm where I am placed, but I wish to be such a man as his presence will make those surrounding him happy however small his area in the realm may be. I sincerely hope that the club members of Saipan R.C. will be a group of such individuals, increasing in number and continuing as a happy, serving club. A BRIEF HISTORY OF THE SAIPAN ROTARY CLUBOn April 11, 1968, Supertyphoon Jean hit Saipan with the intensity of center winds in excess of 200 miles per hour, devastating the island and leaving 90 to 95 percent of the island homes destroyed. This was a great challenge for the two month old Club and its 32 members. The Club immediately swung into action and President Dave appointed Rotarian Glenn Brown, the Deputy Director of Peace Corps/Micronesia, to head up Project Asisti. Above 5,240 appeal letters went out throughout the world asking for assistance. Most of the letters went to Rotary clubs throughout the world. About $12,000 in cash and in material gifts were received within three months after the drive was undertaken. The Hilo Rotary Club sent about 1500 pounds of clothing by military airplane. Most of the clothing was for women and children. South Tokyo Club responded with monetary assistance of Y100,000; Guam Rotary Club donated $1,320; British Overseas Airways Corporation donated $500. In addition, hundreds of friends of Rotary, both here and abroad, gave not only money but also badly needed materials for survival of residents of Saipan, Tinian and Rota. 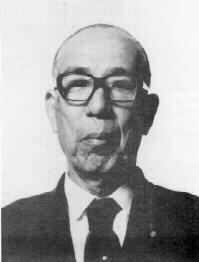 It is interesting to note that Saipan’s First Governor, Carlos Camacho, who was in Rota at the time, actively helped the Saipan Club in extending its Project Asisti to Rota. At the time, Camacho was a medical officer stationed there. Approximately 50 families from Saipan, Tinian and Rota received help from Project Asisti. The Rotary Club also purchased two portable cement mixers and loan them out to families, without charge, needing assistance to rebuild their homes. In 1969, the Rotary Club continued its community projects. The sum of $5,028.97 was donated to the Summer Day Camp where several hundred children participated throughout the summer in week long sessions learning various skills such as swimming, the making of Saipan Rotary Club recognized Mr. Jose S. Sablan, naming him Man of the Year for his contribution of working unselfishly with the children of Saipan at the Summer Day Camp. 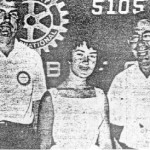 In February 1970, the Saipan Club was invited to a banquet reception in rendering assistance to the community through the various service avenues established by Rotary. 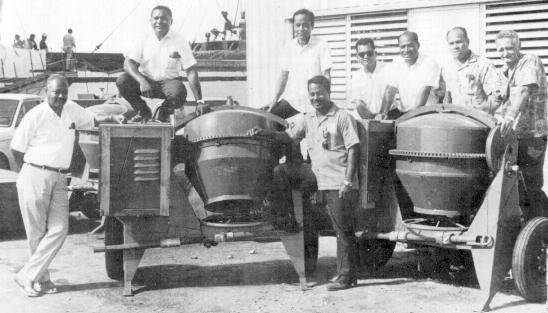 These services, while briefly outlined in these pages, took weeks and countless hours of hard work services and projects were, the construction of the toilet facilities at the public beach in Oleai: funding the training of two policemen who investigation; and sponsoring the 1975 Liberation Day festivities in Saipan. The festivities were highlighted by the visit of the USS RAMSEY with 256 men aboard, plus an ROTC unit from Father Duenas High School in Guam, who had come to participate in the which $11,814.14 was realized from the Las Vegas Night. After all bills were paid, including awards for the Queen candidates, the Club realized a net of $8,213.89. 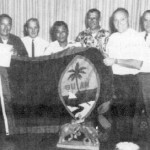 The Saipan Club was honored by Saipan being selected as the site for the 1975 Group II Forum which was held in February 1975. The Occasion was highlighted by the official visit of Governor Senju Sato and Past President Yuasa of Rotary International. Also in 1975, the Saipan assisted in financing the trip of the Honolulu Symphony Orchestra to come to Saipan to perform at public concerts and at Saipan’s schools. Other activities for the year were: an International Song and Dance Festival and the donation of band instruments to Mt. Carmel High School, wherein the Rotary Club donated $800 and Duty Free Shoppers, Ltd., $5,000. The Club also gave $6,000 of its hard earned money to Guam Rotary Clubs for typhoon relief. It would be misleading to give the impression that the Saipan Club had only involved itself in the few activities and projects mentioned in these pages. Unfortunately, due to limited time and space, all that we would like to include cannot be. Perhaps at a later date, a more comprehensive report of the historical events can be written of this fine Club. Saipan – Returning to Saipan last Sunday (Feb. 13) with a new lease on life was little Magdalena Santos, 16 months, who underwent successful heart surgery at the University of California (UC) Hospital in San Francisco. The baby, daughter of Maria Santos of San Roque, was suffering from a birth defect whereby a heart vessel which should have closed at birth didn’t close, according to Dr. Ted McCarthy, attending pediatrician at Dr. Torres Hospital. The open vessel a “short circuit” in the child’s circulatory system, which rendered her a “cardiac cripple,” McCarthy said. The relatively simple surgery closed off the vessel, he said and Magdalena will now have normal blood circulation. The trip and surgery for the ailing baby were arranged primarily through the efforts of McCarthy and the Rotary Club of Saipan, according to Robert Hunter, Rotary’s director of community services. Hunter said that when Rotary decided last summer to direct some of its fund-raising efforts to help in the medical area, McCarthy, a long-time Rotarian, recommended Magdalena as being one who could most profit from surgery abroad. McCarthy arranged for UC Hospital to supply the surgery and hospital care with no charge to Ms. Santos, and the Rotary Club raised close to $1,200 for transportation and per diem expenses of mother and child. Ms. Santos, exhausted from the long night’s flight but beaming over the operation’s success, told the Variety that the total hospital bill would have been close to $7,000. Ms. Santos is grateful for the help of Rotary, UC Hospital and friends along the way who helped her through the ordeal. 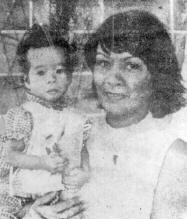 “I was afraid Magdalena wouldn’t make it,” she says now, hardly able to conceal a smile of pride and joy that her baby did so well. McCarthy, who will leave Saipan, permanently March 1, told the Variety there are several other children on Saipan who need heart surgery but that the funds are not presently available to send them on referral. In connection with these Project Asiste, the Saipan Rotary Club ordered and recently received two cement mixers to start on their project of building cement houses to the people needing the most help in building. Rotarians above are (left to right) Chairman Glenn Brown, Elias Okamura, Joe Tenorio and George Perdew. The mixers will be used in pouring foundations and making blocks. Saipan Rotary Club gets under way with their “Project Asiste”, a drive to assist Saipan residents needing the most help in rebuilding their homes which were destroyed by Typhoon Jean. Project Asiste under the Chairmanship of Rotarian Glenn Brown, so far received funds totaling to $4,200.00 from various Rotary Clubs in the United States and Canada including a $1,320.00 from Guam Club and a $1,000.00 from Presbyterian Church in Los Angeles which donation was presented to the Club by Don Hartsock. Other sizeable donations received for Project Asiste were from Captain Harry Fisher from United Tankers of New York, Col. Joaquin Charfauros of SBA Guam. It is the aim of the Saipan Rotary Club to begin the housing project first in Tanapag Village and if fund allow, they will move on to other villages in Saipan and Tinian islands. A word was received by President Dave Sablan that a Rotary Club in South Tokyo, Japan has offered to donate $3,000.00 to the Project and Saipan will receive this funds after they know exactly to whom the donations be directed. President Dave Sablan will accept any gifts either in money or in building materials of all types. All donations are to be directed to Rotary Club of Saipan. 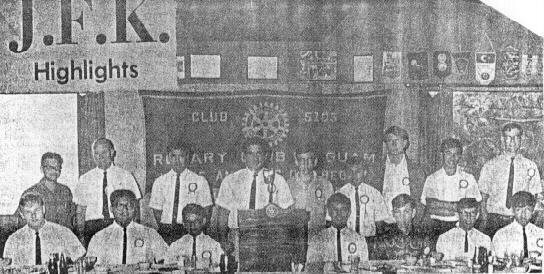 That the John F. Kennedy Interact Club members had high ideals is demonstrated by the following article in the Pacific Journal on 23 October 1967 when the members were guests at the Guam Rotary Club during PP Jim’s year as President of the Rotary club of Guam. “It is our hope to make the Interact club a most effective organization in our school–, stated Eugene Ramsey, President of the JFK Interact club. Last Thursday, the weekly Rotary luncheon was held at the Panciteria restaurant honoring the Interact club. Vice-president Pedro Atalig from Rota stated that the two major projects to be undertaken by the club this year are to establish an essay contest discussing the Viet Nam ware and to help organize more Interact clubs to represent other secondary schools on the island. The fourteen boys who are members of this year’s club had lunch and then heard president Ramsey and vice-president Atalig explain to the Rotarians what the functions of the club are: President Ramsey told the hosts that this years members represent a cross-section of student leaders from many phases of the school Carl Dominguez is president of the national honor society, Joevanni Camacho is vice-president of the student senate, Frank Castro is the elected male senator representing the junior class and Jim Basham is vice-president of the junior class. Pete Atalig is the male senator from the senior class Eugene Ramsey is president of the junior class while Eric Jump, Dwight Schwartz, Anthony Gill, Victor Gamble, Robert Rosalan, Vicente Sian, Vincent Duenas and Reed Smith are active members of other organizations on campus. 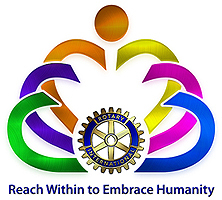 The interact club at JFK is a youth service project organize, sponsored and supervised by the local Rotary Club and is established upon certification of recognition by Rotary International. Membership in the JFKennedy Interact Club, under the direct guidance of Calvin K. Snodgrass, Principal of JFK, is open to male students in grades ten through twelve who process good character and leadership potential and who demonstrate achievement in academic and extra-curricular activities. A few of the Past Presidents of the Rotary Club of Guam, who were present at a recent luncheon, pose for Vic Olsen’s camera. 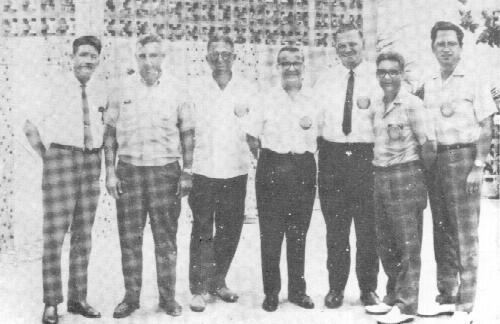 Left to right: Herb Johnston, Al Minot, Phil Lomax, Bob Barry, Norm Flockman, Jim Alger(incumbent) and Carlos Taitano.